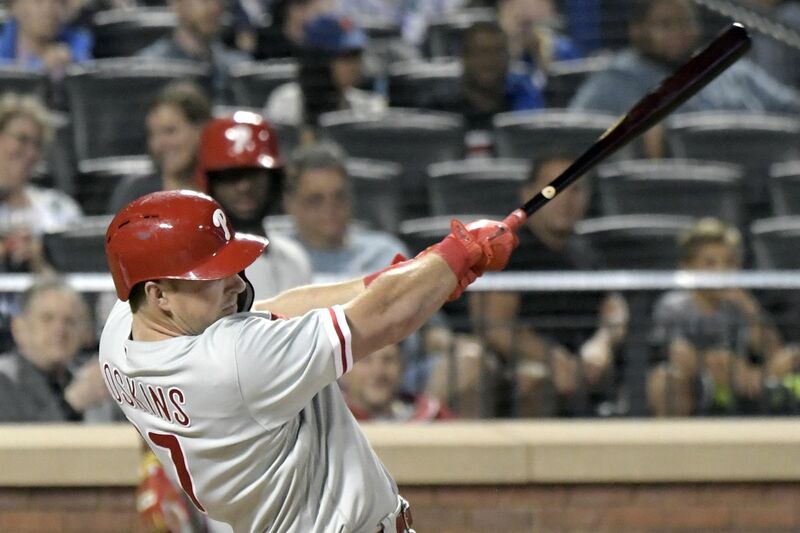 Rhys Hoskins hits a solo home run in the eighth inning to give the Phillies a 4-3 lead against the Mets. NEW YORK — Behold, the power of Rhys Hoskins. It had gone missing for a while. For about a month, actually. By Hoskins' admission, he hasn't seen the ball very well lately, the prime reason for his .172 batting average since Aug. 4 and the 0-for-14 drought that he dragged to the plate in the eighth inning here Friday night against the New York Mets. But Hoskins' power is never far away. When he's at his mightiest, he's capable of carrying the Phillies' fickle offense. And over the next three weeks, as long as the National League East crown remains within reach, the Phillies need him to be closer to mighty. This was the perfect time, then, for Hoskins to power up. Aaron Nola had just allowed the game-tying home run to Mets rookie Dominic Smith. And now, down two strikes to hard-throwing reliever Tyler Bashlor, Hoskins waited for a fastball that crossed the plate at 97 mph. Hoskins slammed a solo homer into the left-field bleachers to bail out Nola and give the Phillies a 4-3 victory in the opener of a three-game series. "I'm buying him dinner tomorrow," Nola said. Indeed, with Mets aces Noah Syndergaard and Jacob deGrom set to start the next two games, it's fair to say the Phillies needed this one. It was only their sixth victory in the last 18 games, but it moved them to within three games of the division-leading Atlanta Braves, who were playing late in Arizona. "The first one's big, especially on the road," Hoskins said after the Phillies won a series opener for the second time in the last 10 series. "Hopefully, we can kind of ride the momentum of this type of win throughout the rest of the weekend and back home." Nola was dominant for a long stretch in the middle of the game, leaning on his bending curveball to retire 12 batters in a row at one point. But while manager Gabe Kapler labeled it "vintage Nola," it was hardly the Cy Young-worthy performance that the 25-year-old righthander has provided almost all season long. Aaron Nola pitched seven innings to improve to 16-4 on the season. The righthander struck out eight and allowed three earned runs – two of them solo home runs – off three hits and a walk. The Phillies handed Nola 2-1 and 3-2 leads, and both times, he fumbled them. He gave up a tough-luck RBI double in the third inning on a check swing by Jeff McNeil that looked more like one of the PGA wedge shots this week at Aronimink. But he also allowed solo homers to Jay Bruce and Smith, and has yielded five homers in 12 2/3 innings over his last two starts after giving up only eight homers in 176 innings in his first 27 starts. Kapler called it "random." But Nola blamed his fastball command. "Four of the five have been fastballs over the plate, and they've put really good swings on them," Nola said. "I'll take the positive out of them that they're solo homers. It's not home runs coming with anybody on, which I guess is a positive." There was no other way for the Phillies to look at Hoskins' big swing. He hadn't gone deep since Aug. 27 and took some ugly swings earlier this week in Miami and in his first three at-bats against Mets starter Steven Matz. Hoskins quickly got down two strikes against Bashlor. But he has been a proficient hitter in that situation all season, with 14 of his 28 homers coming after he gets into a two-strike count. In a weird way, he felt as though he had Bashlor right where he wanted him. "It's funny. I think sometimes when you struggle you seem to be more comfortable with two strikes," Hoskins said. "I think the at-bat becomes more reactionary and not so thoughtful, which simplifies it and can make it easier." Hoskins decided he would lay off Bashlor's slider and sit on a fastball, and he delivered the swing the Phillies have been waiting on for weeks. "Man, that was enormous," Kapler said. "We needed it from him. He needed it for himself. He's the guy that we absolutely know is going to hit. It injected a lot of confidence." That's the power of Hoskins.